Activity Pad and Crayon Set: A Fun Pack! 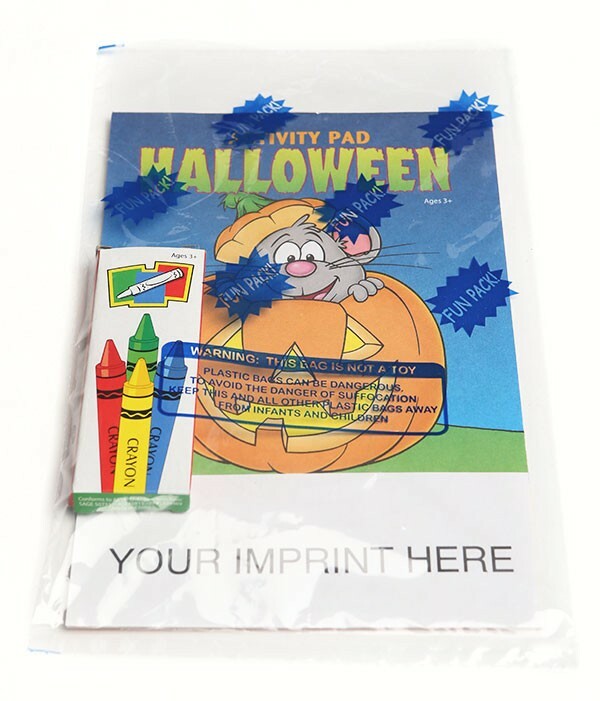 Make it Easy with the activity pad conveniently packaged with a 4-pack of crayons in a sealed poly bag. No assembly required. Halloween is a special time of year. Now your child can experience the Halloween trick-or-treat fun all year round. This Halloween activity pad provides hours of coloring and playing games with 16 pages of fun. Recommended for children ages 3 and up. A great giveaway for costume and party stores. Price includes a one color imprint in standard imprint color (Black, PMS 186 Red, PMS 286 Blue or PMS 355 Green) on activity pad. Imprint area: 4.5" X 1.5"
Optional imprint on crayon box is also available.